Our bible study class just finished studying the 12 Apostles. And it seems that the author of the guide gleaned much of his information from this book. I purchased this for a more in-depth study. The author writes in a style that flows and is easy to understand. Each of the well known apostles is accorded his own individual chapter, thus can be read stand alone. I also purchased 12 Extraordinary Women written by him and look forward to reading it. This is a wonderful book! I've ordered several for gifts to men in my family and church friends. Easy to read and very informative. Praise the Lord for such good writers. great book, using it as reference for a Bible Study. 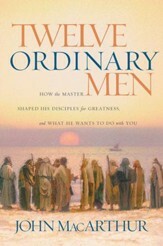 Our study group is thoroughly enjoying this exploration into the men Jesus chose for founding His Church. Emphasizing their undistinguished characteristics before meeting Jesus, the book brings the apostles off the pedestals on which many Christians often place them, and gives readers another demonstration of the Lord's ability to transform all of us and help us walk more closely to His path. Excellent read with a great work book.